Today I have the Jessica Phenom Holiday 2018 Collection for you. This collection features three new shimmery shades and they are not the typical colors for a holiday collection, which is nice. The Phenom range (in case you didn’t know) is a three-step polish system which is supposed to give you a gel-like shine and lasts up to 10 days (when using their Phenom Base coat and Finale Shine Topcoat.) They do not need to be cured, and they remove like any regular polish does. They all cover nicely with two coats. New Year, New Me is a shimmery royal purple. Clean Slate is a shimmery metallic blue. Midnight Kiss is a bright shimmery fuchsia pink. Pretty shades no doubt, but nothing unique. You know I don’t discuss nail polish wear-time often because it’s way too personal from person to person, but these don’t last any longer on me than any regular polish does. 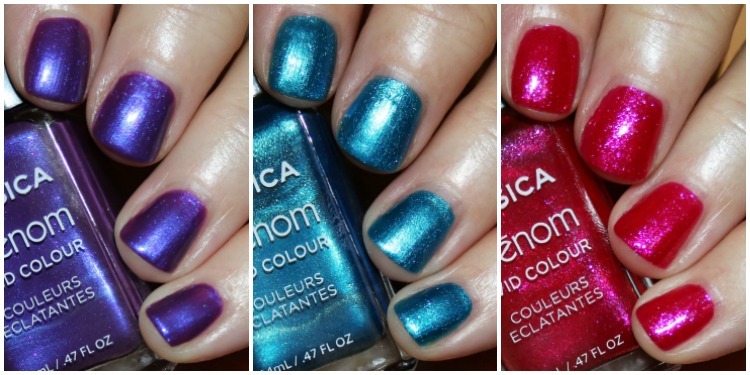 You can find the Jessica Phenom Holiday 2018 Collection on their site and in select salons and they are $11.00 each or $22.00 for the set with Basecoat and Finale Shine. Have you tried Jessica Phenom yet?